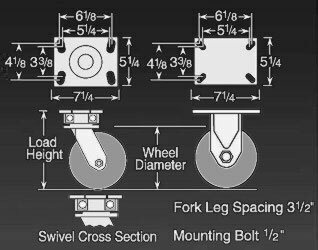 Bolt Spacing: 3-3/8" x 5-1/4" to 4-1/8" x 6-1/8"
Extra heavy-duty Kingpinless casters. HOWI XHD-series lineup is built tough for the most demanding high capacity environments. The the kingpinless swivel head design handles the daily abuse you throw at them. Wheel brakes available. © Copyright 2016 House Of Wheels Incorporated. All Rights Reserved. Built with Volusion.